In Android, almost everything is a resource. Defining resources that you can then access in your app is an essential part of Android development. Resources are used for anything from defining colors, images, layouts, menus, and string values. The value of this is that nothing is hardcoded. Everything is defined in these resource files and then can be referenced within your application's code. The simplest of these resources and the most common is using string resources to allow for flexible, localized text. Property Animations animator XML files that define property animations. Tween Animations anim XML files that define tween animations. Values values XML files with values such as strings, integers, and colors. For the full list of resource types, check out the Providing a Resource guide. you would like to log in with another identity service. Thanks! This is a longer string! For more details on defining string resources, check this guide. You can also refer to this guide for style resources and this guide for other types. And the string value will be retrieved. This similar pattern works for almost any resource from images (drawables) to colors. The getResources() method returns a Resources object with many resource fetching methods. Each resource is defined within different folders and files within the res directory depending on their type. It is important to note that the most current way of accessing color resources (since API 24) requires providing context in order to resolve any custom theme attributes. See this article for more context. That's all you need for color resources. Be sure to keep hardcoded colors out of your layout files. That's all you need for dimension resources. Be sure to use this to keep hardcoded font sizes, padding and margin values out of your layout files. There are many other resource types to explore. Check out the getResources object and getIdentifier for more details. Apps must be designed to work across any different screen densities as well as screen sizes. 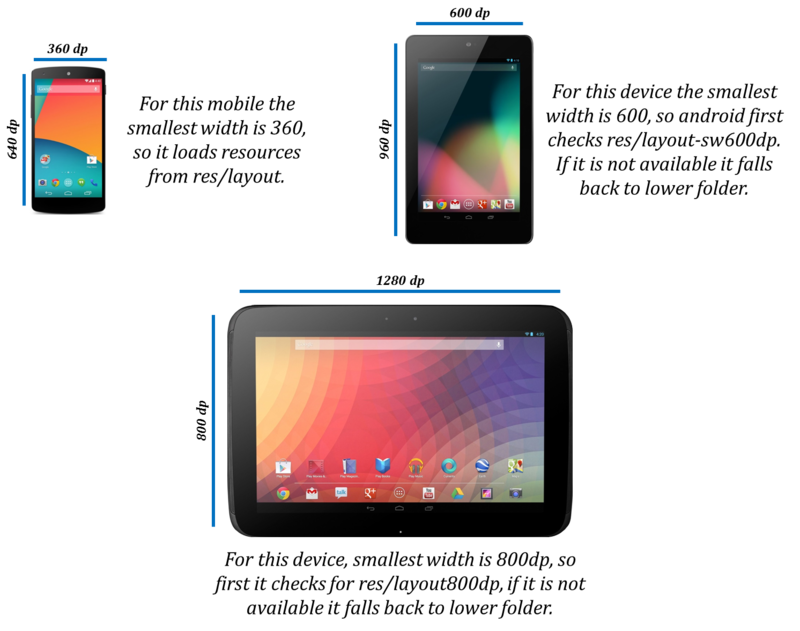 This can be done leveraging a variety of systems provided by the Android framework. To specify configuration-specific alternatives for a set of resources, we create a new directory in res in the form of [resource]-[qualifiers]. For example, one best practice is to ensure that all images are provided for multiple screen densities. Note the resource files need to all have the same name within the different folders. This system works for any type of resource with a wide variety of qualifiers. Screen size sw480dp,sw600dp Minimum width of the screen's height or width. Screen orientation port, land Screen is in portrait or landscape mode. 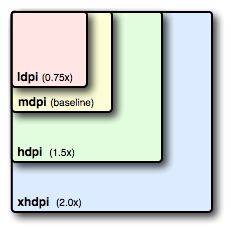 Screen density hdpi, xhdpi Screen density often used for alternate images. Platform version v7, v11, v21 Platform version often used for styles. You can specify multiple qualifiers for a single set of resources, separated by dashes. For example, drawable-en-sw600dp-land applies to English tablets in landscape orientation. Note that if you use multiple qualifiers for a resource directory, you must add them to the directory name in the order they are listed in the table above. See the official docs for the complete set of qualifiers available. To summarize, you can create as many versions of a resource file as is needed for different situations and then the most appropriate version of the resource file is selected automatically by the system. We can similarly access this within any object by getting access to a Context object. For example, within an ArrayAdapter by using getContext().getResources().getConfiguration() to access the configurations. For a detailed tutorial on how to manage responsive layouts for tablets, review our Flexible User Interfaces guide. You can also review this article on UI design best practices and this official doc on resources for more details. Review the rest of the best practices for screen independence on the official guide. When you have a resource that you'd like to use for more than one device configuration, you do not need to put the same resource in more than one alternative resource directory. Instead, you can create an alternative resource that acts as an alias for a resource saved in your default resource directory. When you request a resource for which you provide alternatives, Android selects which alternative resource to use at runtime, depending on the current device configuration. Read the official resource guide for a detailed overview of how the match is selected.